It’s kind of ironic, given that the running game seems to be going the way of the slide rule—not the baseball one but that thingy that the nerds in your Calc 2 class used, if you are as old as I am. Not that I was in Calc 2. Or even Calc 1. The point is, people still dust them off and bring them out on occasion, but not many people really use them a lot anymore, and they are a bit of a curiosity. 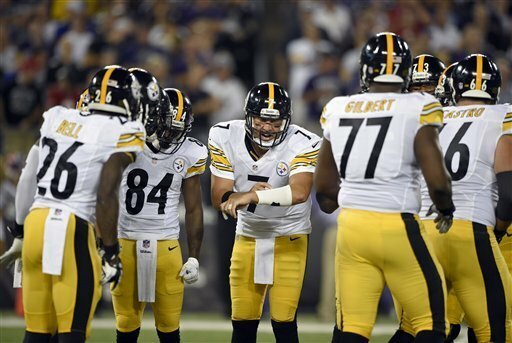 But while the Steelers are scarcely a “three yards and a cloud of dust” team anymore, an efficient and effective running game would certainly be a good plan. Interestingly, despite the Steelers running the ball so much in days of yore, they haven’t managed to reach 5 yards per carry since 1972. Kaboly notes that Terry Bradshaw threw for less than 2000 yards that season, and they ran the ball more than 500 times. I was curious as to how this compares to the apres-Noll Steelers. I found some interesting stuff. As you can see, the number of pass and rush attempts sort of ebbed and flowed until Ben Roethlisberger came into his own, you might say. There’s no question what direction things have been going since about 2008. I expect 2010 would fit right into the trendline had it not been for Ben’s suspension. The bold line in the middle is 5 yards per carry. As you can see, the only team that got close (averaging 4.8 YPC) was the 2001 team. However, it has certainly been trending up. 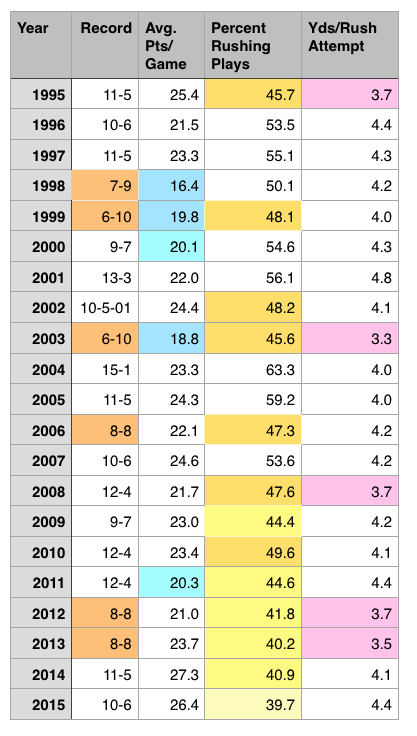 You might think there would be a correlation between average points per game and the percentage of run to pass plays, because you might assume that the game is likely to contain more series for your offense when the ball is being flung about as opposed to being slowly matriculated down the field. And as you can see you would be wrong, at least before about 2011. Since then the percentage of running plays has dropped precipitously and the points per game has moved upwards. One of the things it’s easy to overlook in all this is the defense’s role. I’m not talking about how many points they hold the other team to, since I’m not looking at winning games but strictly at the average points per game and average YPC. But the longer the defense allows the other team to stay on the field, the less overall chances the offense will have to score. And of course the defense can also affect the average points per game by putting a few on the board themselves. But in the end the issue is winning. If the Steelers average 30 points per game, or 40 for that matter, and the running backs are getting 6 YPC, but the record at the end of the season is 8-8, I don’t think anyone will be happy. That said, it’s hard to imagine that if the backs are putting up great numbers and the offense in general is scoring a lot, there won’t be a preponderance of wins. Not very surprisingly, averaging less than 20 points per game correlated exactly with having a losing record. But there isn’t much else that you can really point a finger at. The 2008 Super Bowl-winning squad averaged a meager 3.7 YPC and a not-very-exciting 21.7 average points per game. But that was back when defense won championships. Which it also did this past February. So I guess the point is, I would love to see the offense put up all sorts of incredible numbers, but we’re going to have to hope the defense is going to continue their improvements during the course of last season, because I have a feeling the offense can only carry you so far. I suspect that loses of Bryant, Bell and now. potentially, Green may be enough to cripple the Steelers goals of 5 and 30. I am also a little bit concerned about the lack of Ben the last few practices. Hopefully what ever is happening in his life can be resolved in a positive manner or that it is a just an over cautious approach by the coaching staff to keep Ben healthy. On a possibly unrelated note, there has been a Cyclospora outbreak in Canada recently involving people eating uncooked produce from tropical/sub-tropical areas. I would imagine that the sames sources of food are available in the USA. Considering that many health conscious people consume a lot of fresh, uncooked produce, I wonder if this has been an issue with some NFL players this pre-season.